This figure will be updated in place until the election. Updated commentary appears at the top of the post. Scroll down to read comments in reverse chronological order. 3/27/06: The last polls are in. Time to vote. Kadima continues down. Likud seems to be slipping a bit. Labor a little better. Yisrael Beiteinu continues to climb. Here are my current estimates from the polls completed by March 26. Gil (the retired people's party) may pass the threshold to win 2 mandates but the polling on them is limited. 3/24/06: The final stretch is here, and Kadima continues to lose support. Kadima's support has been falling at a modest but steady rate since the Palestinian elections. Labor shows a very slight gain and Likud an even smaller loss. The big mover among the small parties this election is clearly Yisrael Beiteinu (Israel Our Home) which has climbed from under 6 mandates to nearly 10 in the latest polls. Other small parties are not moving. The slide of Kadima from a high of 40.3 mandates (as estimated by my model) to the current 35.4, makes for a weaker party in coalition negotiations. While there are still numerous coalitions that Kadima might form, it is always better to have more seats than fewer when entering negotiations with other parties. 3/20/06: Support for Kadima has continued to decline over the past week, though with the slightest hint that the rate of decline may have decreased in the latest round of polls, all completed March 13-16. The estimated trend now puts Kadima at 36.1 seats, down from 36.3 a week earlier. That is less decline than the drop from 37.7 on March 1 to 36.3 on March 9. If there are political effects of recent events, they will need more polling to confirm them, and the election is just over a week away. Labor has made a small gain to 19.4 mandates, up from 18.8 a week earlier. Likud has seen a slight decrease, to 16.1 mandates from 16.4 a week earlier. It should go without saying that these tiny changes are certainly not statistically significant. Shas and the National Union+NRP coalition have 9.6 and 9.2 mandates respectively. That is a slight improvement for Shas from 9.2 a week ago and a small decline for Nat'l Union+NRP from 9.8 last week. Yisrael Beiteinu is the party with the greatest relative movement recently, continuing to improve its prospects. This week's estimate is 9.7 mandates, up from last week's 8.9. The other small parties remain unchanged, with Arab parties expected to take 8.4 seats, Yahadut Hatorah 5.8 and Meretz 4.9. With eight days to go there has been little discussion of undecided voters and the question of turnout. At least one poll this week reported 30% undecided. Polls apparently ignore undecided when calculating mandates (otherwise there would be 38 unallocated seats, in this example!) but that seems a dangerous practice. At the least it means we are more uncertain where that undecided vote may land. If it lands disproportionately for one party, the polls could be quite a bit off. Turnout is another unknown. From 1988-99, Israel saw between 75 and 80 percent of eligible voters cast ballots. That fell sharply to 66.7 percent turnout in 2003. There is speculation that this year's balloting might see even lower turnout. However, there has been little empirical evidence as to what turnout might be this time. Polls seem to rarely report this. 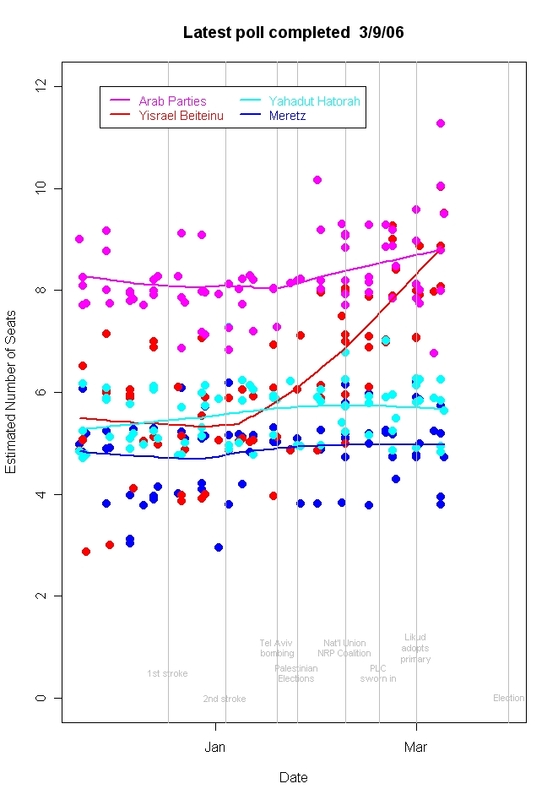 Which parties will be helped and which hurt by a low turnout? Stay tuned. 3/9/06: The downward trend for Kadima has continued over the past week, while Likud has clearly developed a small but consistent upward movement. As of polling completed March 8 and 9, my trend estimate is 36.3 seats for Kadima, down from 37.7 seats as of March 1 polls. Likud has moved up to 16.4 from 15.9 over the same time. 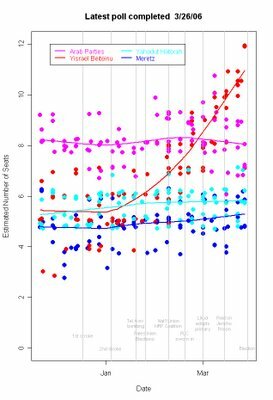 Meanwhile Labor has shown a very slight drift down, with a current estimate of 18.8 seats down from 19.1 a week earlier. Shas and National Union+NRP have continued their modest and opposite trends: Shas has fallen to 9.2 seats from 9.7 while the National Union+NRP coalition has barely moved up to 9.8 seats from 9.7. 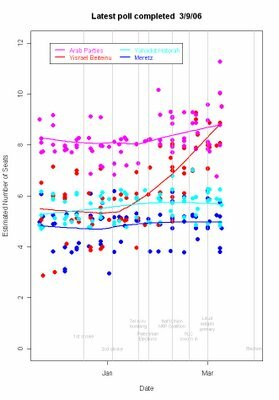 I've been remiss in not including reports on the smaller parties, especially since they can be crucial for coalition formation despite small numbers of seats. I confess that part of the reason for ignoring them is that they are somewhat harder to graph intelligibly because the data clump together in a small range (all are under 10 seats). That is a poor excuse. However, I can't ignore them any longer, so here is the first graph of how they are doing. Note that in order to improve readability I have added a small amount of random noise to each datapoint so that they don't fall on top of each other as much as the actual data do. All poll estimates are integer numbers, so these points differ from integers due to this added noise. The trend lines are based on the actual data without the noise added. 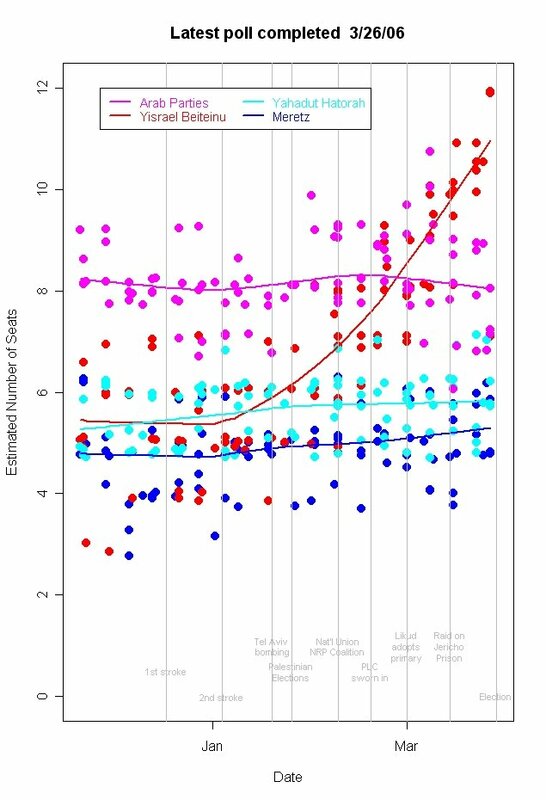 The graph makes clear immediately one reason I should not have been ignoring these parties: Yisrael Beiteinu (Israel Our Home) has made significant gains, from a fraction over 5 seats to a current estimate of 8.9 seats. Yisrael Beiteinu is supported primarily by immigrants from the former Soviet Union and has taken a secular position, favoring public transportation on the Sabbath, civil marriages, and separation of religion and state. It is also strongly right wing on security issues and negotiations with the Palestinians. The gains for Yisrael Beiteinu coincide with the collapse of the secular centrist party Shinui. There was press speculation at the time that Yisrael Beiteinu was emphasizing its pro-secular policies in an effort to win over some former Shinui supporters. The polling data don't allow us to know where the new supporters came from, but the timing suggests Yisrael Beiteinu may have succeeded to some extent in winning at least some Shinui supporters. Otherwise, the polling data show that the Arab Parties are expected to control 8 or 9 seats, with the current estimate being 8.8, up slightly in the last six weeks. Yahadut Hatorah (United Torah Judaism), the ultra-Orthodox coaltion of the Hasidic Agudat Yisrael and the Lithuanian Degel Hatorah, has remained between 5 and 6 seats, with a current estimate of 5.7 seats. Meretz, the leftist social democratic party, has hardly moved, with a current estimate of 5.0 seats. So here are the current estimates: Feel free to create your own coaltions! Left-right, security, secular-religious: you figure out which tradeoffs will be made and what government might form. There has also been a slight movement since National Union and the NRP announced on February 8th they would run together, as the trend line suggests. The gain so far has been from 8.8 seats on 2/8 to 9.7 seats on 3/1. Shas has declined slightly in the mean time, from a maximum of 9.9 seats on January 11 to 9.7 on March 1. 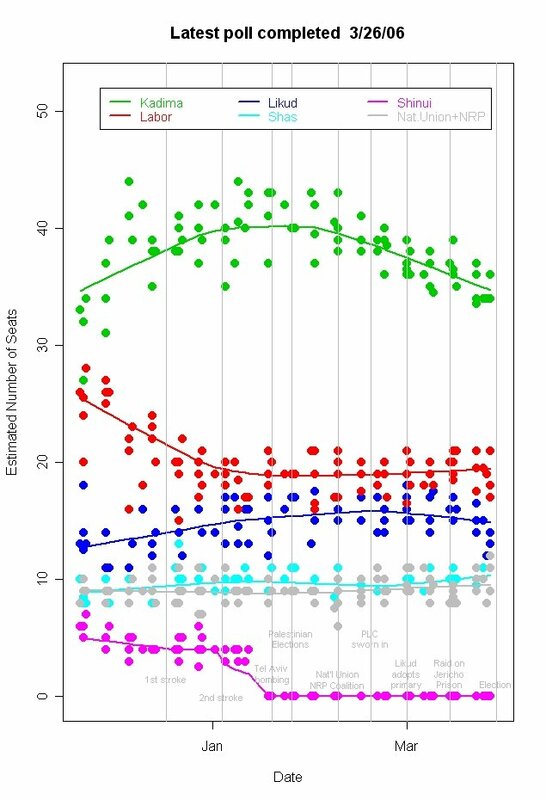 Estimation: These estimates are based on all polls completed since elections were called and use a local regression estimator, the trend line plotted in the figure above, to estimate the support for each party, eliminating the poll-to-poll variability. The estimates are in predicted number of seats for each party. Israeli pollsters are generally silent as to the margin of error of their estimates, or even how they allocate seats given some percentage of undecided voters. I ignore this and simply fit the trend of all polls taken together. 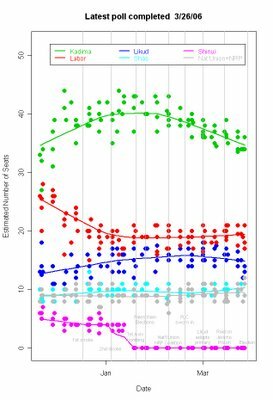 The variation of points around my trend lines gives a good visual impression of the uncertainty across polls at each point in time.